The Insanity of God is the personal and lifelong journey of an ordinary couple from rural Kentucky who thought they were going on just your ordinary missionary pilgrimage, but discovered it would be anything but. After spending over six hard years doing relief work in Somalia, and experiencing life where it looked like God had turned away completely and He was clueless about the tragedies of life, the couple had a crisis of faith and left Africa asking God, "Does the gospel work anywhere when it is really a hard place? It sure didn't work in Somalia. Nik recalls that, “God had always been so real to me, to Ruth, and to our boys. But was He enough, for the utter weariness of soul I experienced at that time, in that place, under those circumstances?” It is a question that many have asked and one that, if answered, can lead us to a whole new world of faith. How does faith survive, let alone flourish in a place like the Middle East? How can Good truly overcome such evil? How do you maintain hope when all is darkness around you? How can we say “greater is He that is in me than he that is in the world” when it may not be visibly true in that place at that time? How does anyone live an abundant, victorious Christian life in our world’s toughest places? Can Christianity even work outside of Western, dressed-up, ordered nations? If so, how? 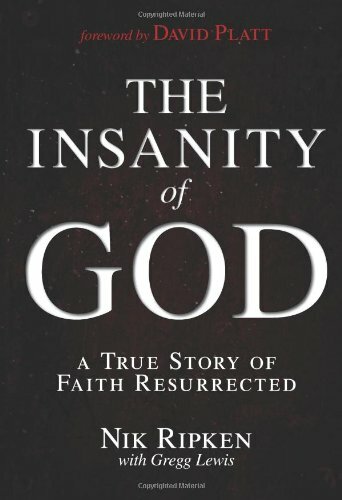 The Insanity of God tells a story—a remarkable and unique story to be sure, yet at heart a very human story—of the Ripkens’ own spiritual and emotional odyssey. The gripping, narrative account of a personal pilgrimage into some of the toughest places on earth, combined with sobering and insightful stories of the remarkable people of faith Nik and Ruth encountered on their journeys, will serve as a powerful course of revelation, growth, and challenge for anyone who wants to know whether God truly is enough. Nik Ripkin truly experienced what believers know intellectually but often do not understand experientially. He saw God leading in unexpected ways in places where he thought Christianity could not possibly thrive. Dr. Ripken did not always go on these dangerous journeys willingly or easily; but he did submit in obedience. That obedience led he and his wife on a journey that lasted more than fifteen years; a journey that showed them God and His salvation in ways they never would have expected. I have been putting off the writing of this review for quite some time. Many notes were jotted down in preparation. After referring back to them a number of times I failed at writing one. I now understand that I just cannot give The Insanity of God the justice it deserves. The best thing that I can do is leave you with a couple of quotes from the book and strongly urge all believers to pick it up and spend some prayerful time experiencing the justice, might, power, and glory of God. Go, serve, and do so with wisdom from your Lord and Savior Jesus Christ. The Ripkens and their teams served throughout the Horn of Africa within famine and war zones; resettling refugees, providing famine relief, and operating mobile medical clinics. Formerly Muslims, many Somali believers, suffered for their faith. Most were martyred. Near the end of the Ripken’s tenure among the Somalis, their 16-year-old son died of an asthma attack on Easter Sunday morning. He’s buried at the school from which the other Ripken children graduated. One year later, the Holy Spirit led the Ripkens to begin a global pilgrimage to learn from believers in persecution how to recapture a biblical missiology of witness and house-church planting in the midst of persecution and martyrdom. Most of all, believers in persecution modeled for the Ripkens how to trust Jesus completely. Many of these lessons have been lost or forgotten by the church in the West. Currently the Ripkens have interviewed over 600 believers in persecution, exceeding 72 countries. Sitting at their feet, the Ripkens learned from the suffering church how to thrive amidst suffering, not merely survive. The Ripkens, using everything they’ve learned from believers in persecution are creating resources as gifts from the church to the church. To date they have created articles, books, a music CD, a documentary, workshops, and other tools that allow the church in persecution to teach the church in the West about its biblical heritage of both crucifixion and resurrection. A teaching DVD is included in future plans. All these tools are designed to challenge believers to boldly follow Jesus, sharing their faith with others - no matter the cost. Gregg Lewis is an internationally known free-lance author with more than 50 books to his credit. He was born in Michigan and raised in a small town in Kentucky. He attended Asbury College, where he majored in history secondary education and made plans to teach high school history once he graduated. However, he took Asbury’s first journalism class the fall of his senior year. His professor was so impressed that he wrote Gregg a letter suggesting a career in writing rather than teaching and subsequently recommended him for an associate editor position in Chicago. Gregg took the job and began his writing career creating Sunday School curriculum for David C. Cook publishing.